Elizabeth McNally, MD, PhD, the Elizabeth J. Ward Professor, and Mattia Quattrocelli, PhD, postdoctoral fellow in McNally’s lab, were co-author and co-senior author, respectively, on a paper published in Nature Communications. Elizabeth McNally, MD, PhD, the Elizabeth J. 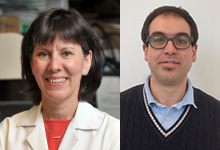 Ward Professor of Genetic Medicine, was a co-author on the study and Mattia Quattrocelli, PhD, a postdoctoral fellow in McNally’s lab, was one of the study’s co-senior authors. 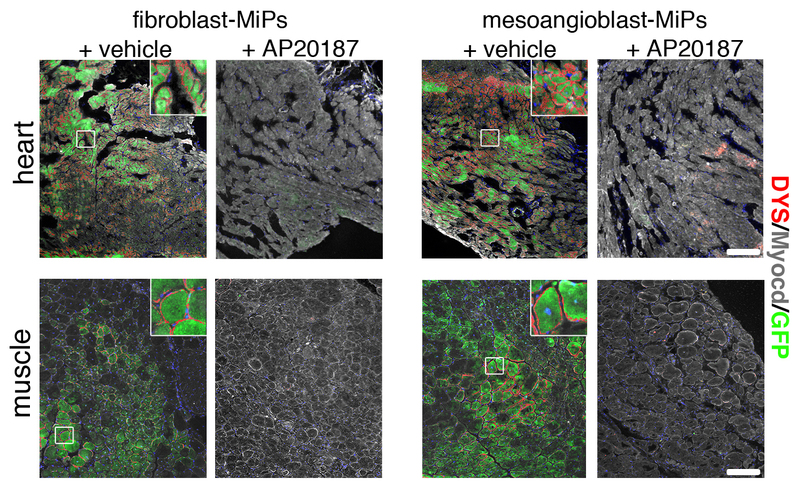 Past studies have shown that mouse-derived mesodermal iPSC-derived progenitor (MiP) stem cells can spur muscle regeneration in mice, with the unprecedented advantage of regenerating both heart and muscle tissue with the same stem cell type. However, the viability of human–based cells to perform similarly had been largely untested. To investigate if human stem cells can effectively regenerate lost muscle tissue, the Northwestern Medicine scientists injected human MiP cells into mouse models, finding increased heart volume and improved muscle structure compared to controls with untreated muscle degeneration. When they later introduced a drug to downregulate the MiPs, the beneficial effects were reversed, bolstering the evidence that human MiPs have regenerative potential. “While we can make stem cells differentiate into cardiac cells, making them differentiate into muscle cells has not been as easy,” said McNally, who is also the director of the Center for Genetic Medicine and a professor of Medicine in the Division of Cardiology and of Biochemistry and Molecular Genetics. 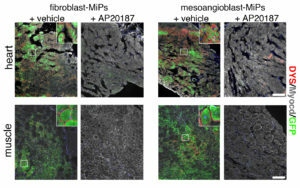 Images showing MiPs inducing regeneration of both heart and muscle tissue (green), and subsequent destruction of regenerated tissue when the MiPs are turned off by the molecule AP20187. “If safety and efficacy are confirmed in larger models, this cell-based approach could theoretically help in combating many types of muscle degeneration in patients,” Quattrocelli said.